Any space where a man can put his favorite things and go to be alone is considered a man cave. You may have also heard it called a man-space or mantuary since it is a space or a sanctuary designed by a man for himself to be able to do what he wants to do in his own space. It's kind of like the little boy tree house concept where girls are not allowed. This concept has gotten a lot of attention in recent years, but it is not a new one. Men have had their own spaces for years. Usually the garage or workshop were the spaces men used for their own solitude or to work without being interrupted. Today, it's any room, den, attic, basement, shed, workshop, garage or other space or room in or around the house that is dedicated to the man of the house. Many elaborate designs have been created by men for their own personal man-space. What kind of "space" is ideal for creating a great man cave? 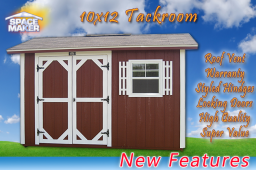 A 10 x 16 Tennessee storage gable portable building. What features make this the ultimate building for a man's own personal space? • It is just the right size for all your "stuff". • It is a blank canvas on the inside so you can be as creative as you want. 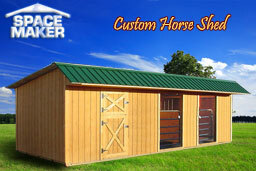 • It can be customized to suit your specifications before you buy it. • It is versatile enough to use as office space, play space or work space. • It is durable and strong with 25 year roofing shingles with insulated decking. • It provides a locking door option and hardware for security and protection. • It offers a sanded, smooth plywood floor. There are plenty of things you can do with a storage gable when you transform it into your man cave. Because of the integrity, security and durability of this type of structure you can turn it into any one of these types of spaces. These are just a few ideas for your man cave. 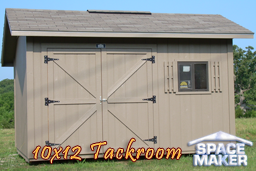 Since this is your space you get to choose how you want your portable Man Cave building customized prior to making your purchase. You also get to choose what you put in it and how you use it. It's all in how you design your own man-space.